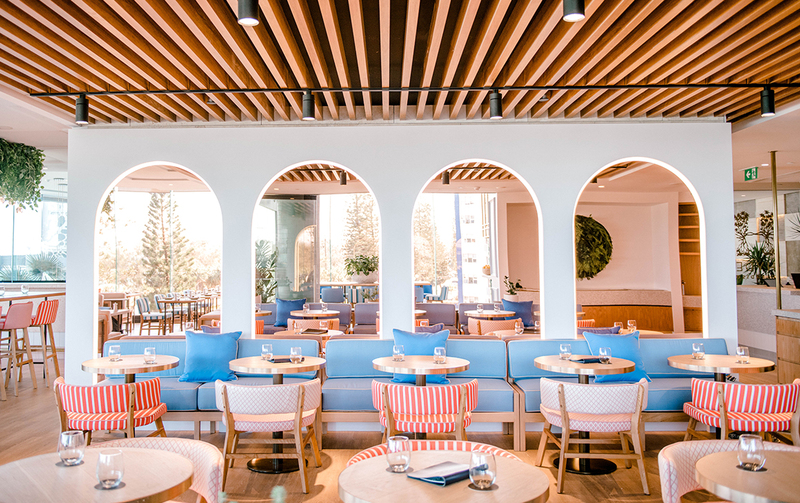 The temperature might be dropping but the opening of Hyde Paradiso this week means we can enjoy an endless summer thanks to its stunning 180-degree beach views and LA-inspired interior. 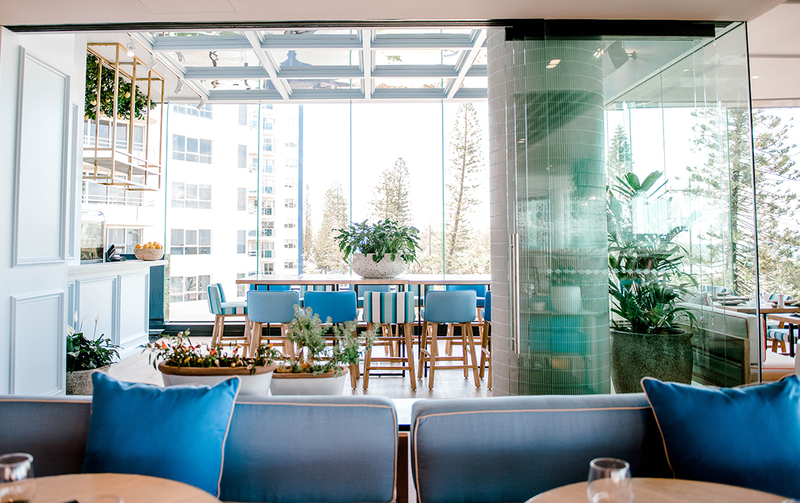 Located at the stunning Peppers Soul resort in Surfers Paradise, the new restaurant and bar comes to us directly from the US, where renown hospitality brand Hyde has opened a string of hugely successful, celebrity-adored hot spots. And we’re pretty chuffed they chose the Gold Coast for their first ever Australian location. Step one foot inside the sprawling restaurant and you’ll feel like you’re on a European holiday—minus the airfare. 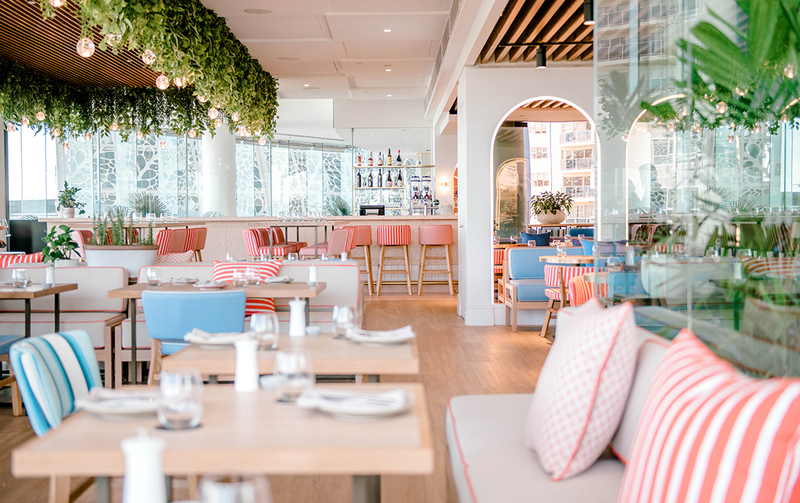 Channelling the colours of LA and the Mediterranean, there’s a mix of high tables and cosy booths in dusty pinks, corals and pastel blue. There are touches of gold, blonde timber and sleek lighting fixtures. But our favourite part has to be the hanging garden, drawing your eye up and then out to the stunning and uninterrupted beach vista. If you’re after a more private affair, you can rent the Sgroppino Room which seats 12 or 25 for cocktails. It boasts its own private bar and the same incredible coastal views, in short, it’s the perfect spot for a birthday or special occasion. On to the most important part, the food. Executive Chef Joel F. Bryant formerly of Oskars, has created a fresh, moreish menu inspired by his overseas adventures. We recommend starting with some fresh Turkish bread with taramosalata and the sumac, salt and pepper squid. Next up grab the heirloom tomato, whipped feta and cab sav salad, the roasted cauliflower with ghee and pomegranate and the melt-in-your-mouth BBQ baby octopus. Because the menu is designed to be shared, it means you can really go all out with your order, so do yourself a favour and tuck into the Australia lamb rack with chimichurri and saffron rice—you’ll smell the dish well before it arrives at your table so be careful not to drool. If you’re the type that struggles to choose then opt for the Taste Paradiso menu (minimum two people at $65 each). 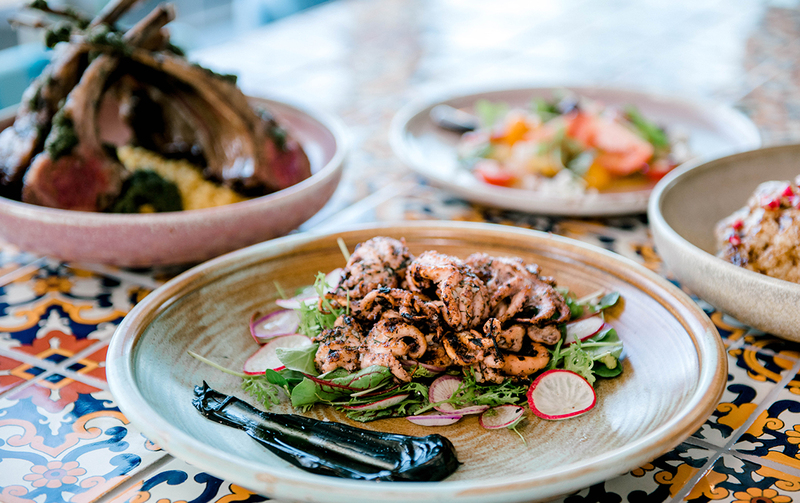 You’ll be treated to a delicious spread of their favourite dishes like lamb kofta, Portuguese chicken with chickpea salad and whole baby reef fish with lemon and fennel. Thirsty? These guys know how to make an excellent tipple. 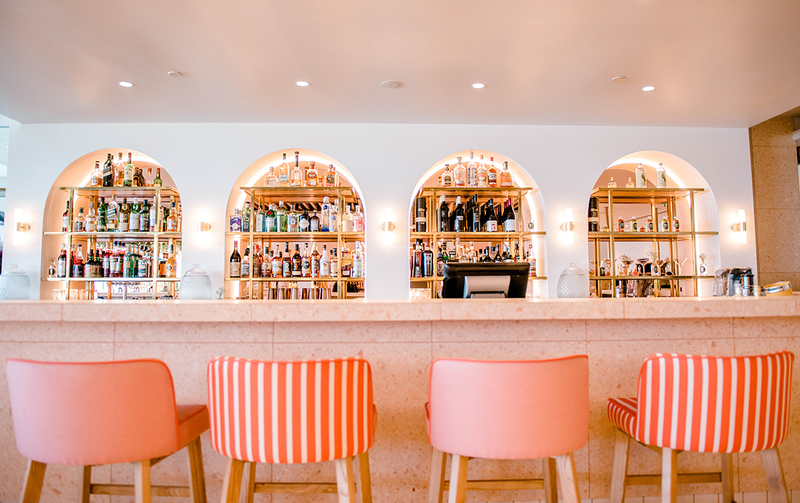 The 12-metre-long pink terrazzo bar specialises in ‘Shared Cocktails’ which basically means they’re absolutely huge and oh so flavoursome. We chose the Top Of The Town Punch. 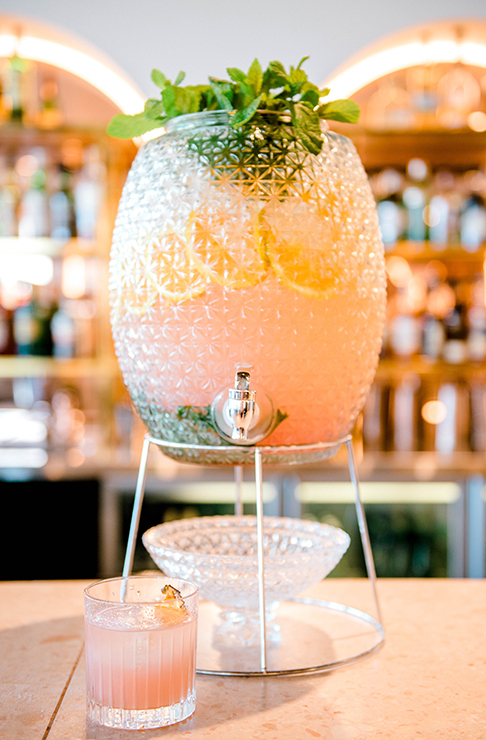 Served in a large drink dispenser, you can poor your own cocktail at your table which just makes you feel that little bit special. The punch, which serves eight to 10 drinks, is a blend of Ciroc vodka, capaletti, sparkling wine, pineapple juice, Crawley’s orgeat, lime juice and mint and it’s absolutely delicious. And you have to try their signature cocktail, the Sgroppino, an adult slushie that originates from Italy. There are three to try. The Classico (Limoncello, processco, lemon sorbet and mint), the Aperitivo (Pimms, processco, strawberry sorbet and cucumber) and the Digestivo (Amaretto, prosecco, vanilla sorbet and coffee beans). There’s also a large selection of wine, bubbles and beer, so no matter your poison, everyone is covered. Friday through Sunday, Hyde will get the weekend party vibes flowing with guest local and international DJs cranking out sweet tunes into the night. And you’ll want to get familiar with their Bottomless Brunch, kicking off every weekend from 12pm. Yep, at Hyde Paradiso the summer—and party—never ends.